When board members of this maternity and pediatric hospital realized that their sterile, all-white ER needed some cheerful, child-friendly interventions, they organized a competition. 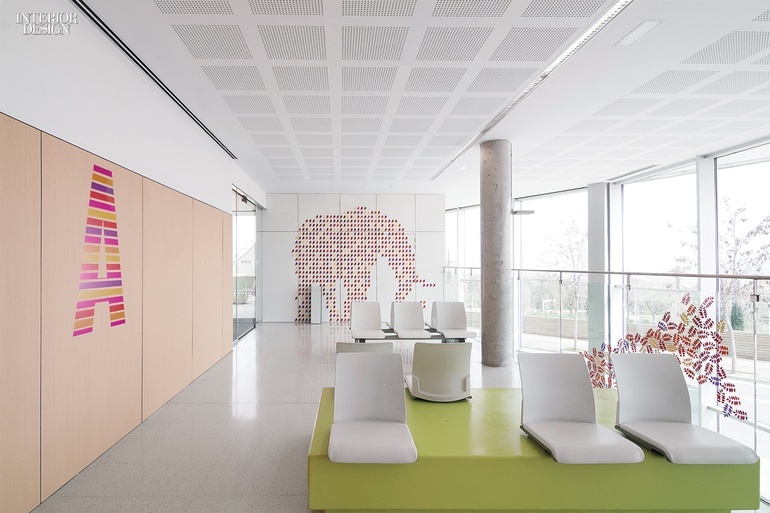 Judging was blind, but the winner turned out to be a designer who had previously collaborated on the hospital’s boardroom. This time, turned to graphics appealing enough to infuse pluck in pint-size patients. Frozen and Barbie themes were out. “Nothing cloyingly infantile. It had to be attractive to the adults that work there every day, too,” Pinto says. He eventually settled on a menagerie motif combining three elements in different variations: life-size but abstracted animal shapes, patterns created by stripes or circles, and a color palette of purple, pink, red, orange, and yellow. Shuffled and reshuffled, in 2-D and 3-D, these elements made for seemingly limitless permutations—over 100 animals appear throughout the 40,000 square feet. A tiger, rendered in lacquered plywood slats, slinks along a wall. Jellyfish murals in vinyl adhesive sport dangling tentacles in rope. The prognosis? Very good. The scheme is scheduled to go hospital-wide. Maritza Ramos Lasso; Nerea Borrell Cedó: Rai Pinto Studio. : Architecture.